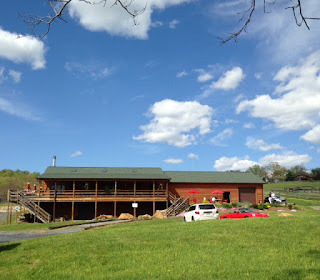 On a beautiful spring day, my little family drove out to Hume, Virginia for a friend’s birthday party at Desert Rose Winery. Desert Rose has a mix of red, white, and rose wines in their tasting. Among our favorites were the Fiery Run Cab Franc and Ole Moo Moo (a crisp white wine named after one of the owners’ cows who lived on the property for 26 years). After our tasting, we bought a few bottles and moved outside to have a picnic and share cupcakes that I made for my friend. As the birthday girl is a big horse fan, Bob brought down a few of his beautiful horses for us to see and pet. When Jax saw the first horse (a big, black Arabian), his little mouth fell open and he whispered “dog”. Haha! There is one other thing you should know about Desert Rose Winery, and that is that it is the newest winery to join the VA Wine Trail of geocaches! You can find the new cache listing here. We hope you are able to stop by, find the new cache, and enjoy this beautiful Virginia winery. This winery looks adorable and delighted to know that you had such a great time on your friend’s birthday over there. My sister’s 18th birthday is coming up and we will be having a grand karaoke party for her at one of her favorite party venues in Los Angeles. Eagerly waiting for it.